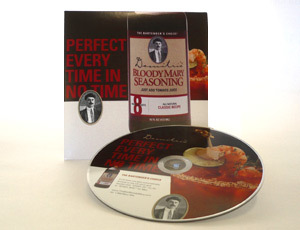 Design Hovie Studios, Inc. has designed the new promotional CD packaging and company brochure for Demitri's Bloody Mary Seasoning. Demitri's Bloody Mary Seasoning is a multi-award winning product that has been a favorite since its inception in 1989. The CD face and packaging reflect the bold brand identity created by Design Hovie Studios for Demitri's. The brochure, pared down from a multi-page 8.5"x11" document, is a tidy 4.75"x4.75" piece that is just as informative yet fits perfectly in the CD pack. The entire project was completed in two months by Creative Director Hovie Hawk and designer Paula Vuncannon.